Celui-ci vient de la bibliothèque municipale d'Oberursel. This one is from Oberursel's town library. Er kommt aus der oberurseler Stadt Bücherei. Et voici le livre que nous avons à la maison / Here's the book we have at home / Hier ist der Buch, dass wir zu Hause haben. Comme vous pouvez le voir, c'est un livre-puzzle. Chaque page renferme quatre pièces de puzzle et toutes ces pièces mises bout-à-bout forment un très beau tableau. Ce qui est aussi malin, c'est que le puzzle est légèrement différent des images du livre: un poisson en plus par-ici, un oeil ouvert par-là... Les enfants ont donc une troisième activité "bonus": le jeu des différences! As you can see, it's a puzzle-book. Each page holds four puzzle pieces and when you put them together you have a lovely drawing. What is really ingenious with this puzzle is that the drawing on the book is slightly different than the one on the puzzle: an added fish here, an open eye there... Children have a third activity "bonus": the differences game! Sie können sehen dass es ein Puzzlebuch ist. Jedes Seite hat vier Puzzlestücke. Alle zusammen schaffen eine sehr schöne Bildung. Und es gibt noch einen anderen Spiel: der Unterschiede Spiel, zwichen die Bildungen von des Puzzles und des Buchs! Les écailles d'Arc-en-Ciel brillent, ce qui plait beaucoup à ma fille de 2 ans! Rainbow's scales shine, and my 2 years old daughter enjoys it quite much! Regenbogen hat hellen Schuppen, und meine 2 Jahre alt Tochter mag es gern! 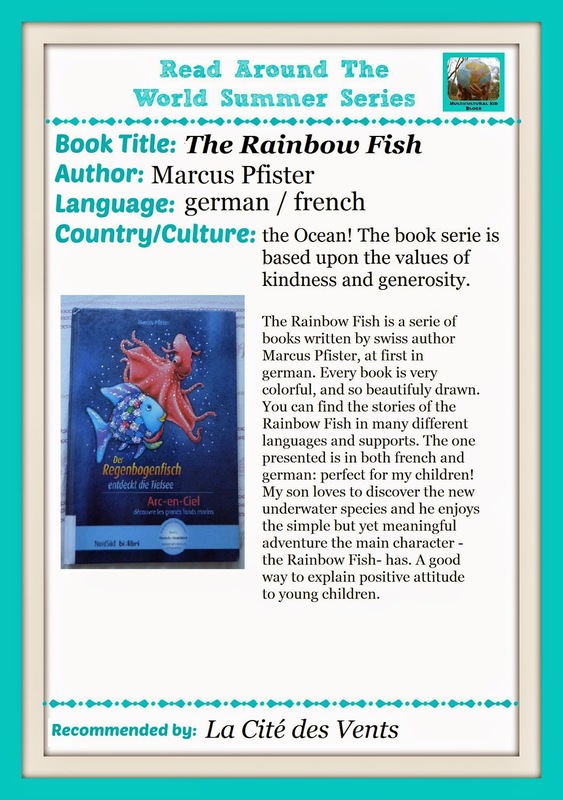 Gabriel discovered Rainbow's univers while he was in his first year of pre-school, in France. We even had found the book at Vitry-sur-Seine's library. This serie is well adapted for children between 3 and 6 years old. I recommand it to pass a nice reading time with your children, to discover the see and its inhabitants or to talk about constructive values (friendship, mutual aid, etc). Gabriel entdeckte der Regenbogenfisch's Welt wann er in seinem ersten Kindergartenjahre war. Wir hatten in Vitry-sur-Seine Bücherei das Buch ausgeliehen. Diese Serie ist gute für Kinder zwichen 3 und 6 Jahre alt. Mit den, entdecken Ihre Kindern die See und die Seetiere, und sprechen Sie über konstruktive Werte (Freundschaft, gegenseitig Hilfe, etc). This blog post is part of the Read Around the World Summer Reading Series of the MKB community. You can find all the other books on the Pinterest Board dedicated for this Serie or on the MKB blog. Well, the first book of this serie was a "regular" album. The books were so loved by the public that they have declined them in different supports, such as puzzle-books, booklets, games, etc.